I don’t generally like buying figurines, because they’re so tricky to dust, and I have a tendency to knock them off the shelves when I try… my big-headed Little Nell statuette has taken more swan-dives off the bedside table than I can count, thanks to how top-heavy her glittery top-hat makes her! Of course, that wouldn’t be such an issue if I left them in their original boxes… but where’s the fun in that, eh? 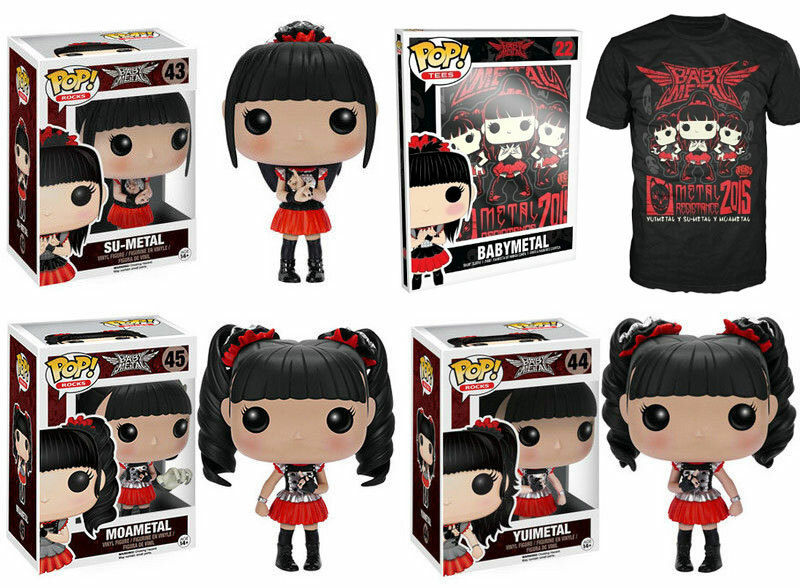 If I did have a proper display cabinet (or less buttery-fingers), then I’d be very keen to get my hands on the adorable new Funko vinyl figures of Babymetal band-members Su-metal, Yuimetal, and Moametal, which will be released (separately) at the end of the month. There’s also a “Tour Poster” T-shirt, with super-cute cartoon versions of the band on the front… which I’d also be itching to order, if I hadn’t already earmarked the rest of my Xmas money for boring practical things like a memory card and battery charger, dammit! This entry was posted in Rants about Music and tagged Babymetal, Moametal, Su-metal, Yuimetal. Bookmark the permalink.